I received book for review from Capstone. The opinions within this post are of my own and I was not influenced in any way. Please do your own research before purchasing products or using services. Your opinions and results may differ. Rabbit loves carrots. Maybe a little too much. In fact, his carrots are crowding him out of his cozy burrow. When his friends offer to help — that’s just asking for trouble. TOO much trouble! This charming and lovingly illustrated picture book shows how friendships get us over the rough spots in life, even if the going gets a little bumpy! 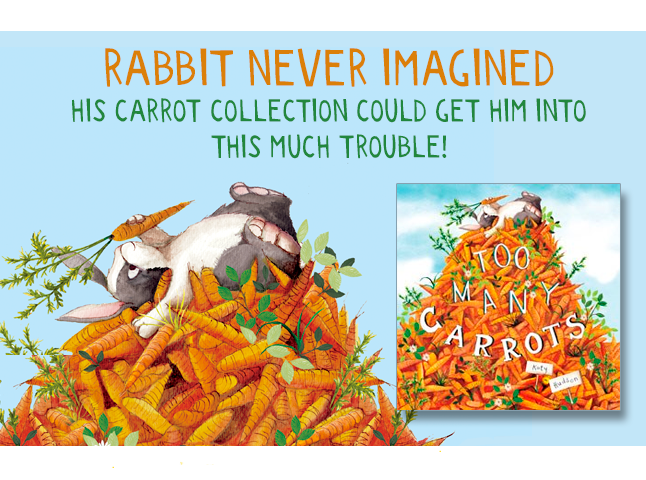 A book for the preschool ages, Too Many Carrots is a darling tale of a rabbit who hordes carrots. When the rabbit comes to the realization that he owns too many carrots, he goes on a quest to find a new home for himself and his favorite food. He comes across a turtle, a beaver, and a bird. During each encounter, the rabbit has brought along so many carrots with him that it causes disaster. In the end, all three animal friends are without a place to stay because of rabbit and the carrots. Rabbit gets some clarity and realizes that he can fix the problem by having the animal friends stay with him, and by sharing all his carrots. Because, after all, sharing makes everything better. Although it is the Easter season and this book would make a great gift for a young child's Easter basket, Too Many Carrots is a charming story that would be delightful to read any time of year. It's a short tale told to reiterate that there can be too much of a good thing, and that caring and sharing are the proper thing to do. 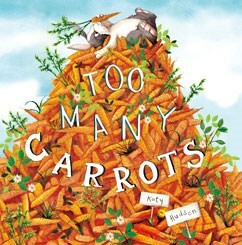 Barnes & Noble is featuring Too Many Carrots, by Katy Hudson, as its Picture Book of the Month. (Too Many Carrots Children's Book Review) I just saw this book yesterday while I was in Barnes & Noble Book store. I know it is a book that my grandson would really like. This is perfect for Easter time. It looks really cute! What a very cute book! My daughter loves rabbits and carrots, she would have loved this book when she was young. What a cute book. This would be a perfect story to read to my granddaughter this week-end.